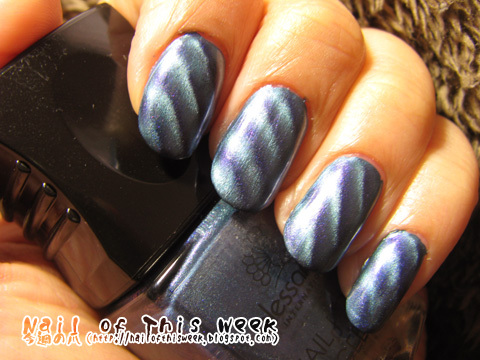 #016: Navy blue “magnetic” stripe : Nail of This Week. I’m very sure I was too happy when I found this in my local…discount store! It was released at 2010 fall, and I knew about this great polish and magnet just last year, which is way too late…but finally I could get it, also in great price (30% discounted), so I’m really happy. Application was actually a bit tricky. Formula itself is nice and smooth, but because you have to apply pretty thick otherwise it’ll dry up BEFORE you apply the magnet, it easily spread into the cuticle. Application of magnet was also not hiper-easy, but well…it could be improved by several practicing.